A proper irrigation system is vital to help your plants flourish, as well as, to save water. However, hand-watering gardens, flower beds, and lawns can be a hassle and a time-consuming task. Maintaining your garden can be more tiresome if you have a busy schedule because dragging hoses, moving sprinklers around, and watering each plant takes time. To avoid such hassles, it is best to incorporate the latest irrigation system for your landscape to make your life easier. Moreover, if you’re also concerned about the efficient use of water, it makes sense to incorporate water-saving strategies into your landscape plan. The new innovative watering systems make it easy to give plants the consistent moisture they need, in addition to saving water. These efficient garden watering systems ensures your peace of mind in all seasons, without the need for hoses or sprinklers to move around. Moreover, some customizable systems allow you to add a timer so that your garden will water itself. The watering methods which work well for a landscape somewhat depend on planting arrangement and crop type. Depending on your needs, you can choose the best irrigation system for your gardens. One of the best irrigation systems is the Drip Soaker Hose System which works especially well for closely spaced crops and intensively planted beds. This system makes use of a soaker hose to provide slow and deep watering to the plants. It is perfect for watering foundation plantings and multiple garden beds. Drip irrigation systems apply water at the root zone and distribute water at regular intervals through a network of hoses or tapes with slits, pores, emitters or drippers. This type of irrigation is typically used for farms and commercial greenhouses, but now the professional drip irrigation is used for residential gardens as well. This system is a great option to conserve water because as compared to overhead watering, soaker hoses consumes around 80% less water. You can easily set up a watering system by alternating sections of soaker hose and a garden hose. Thus, unlike surface and sprinkler irrigation, drip irrigation slowly drips water to the roots of plants, so that only part of the soil in which the roots grow is wetted. This is best suited for rows of crops spaced at varying intervals and for properly leveled ground. Creating a flawless and splendid garden takes lots of time and efforts. If you want to maintain your lawn all the year round without putting much effort, think about installing a proper sprinkler system to save your time, as well as, money. 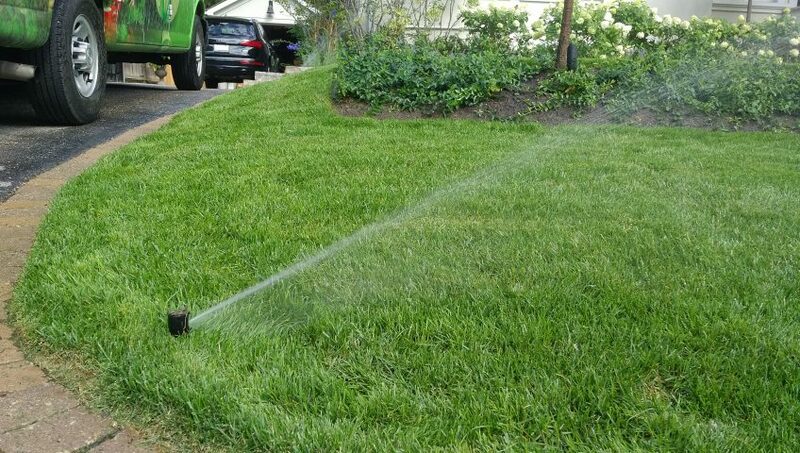 To water larger areas, like ground covers and perennial plantings, an in-ground irrigation system is the best option which ensures that the right kind of head delivers the appropriate amount of water. However, it is important here to plan your landscape project properly by organizing plants according to low, moderate and high water use. This is done to make sure that the spray heads are installed in a zone with plants of similar watering needs. You can have a customizable system with sturdy sprinklers. The system will include built-in ground spikes. The 180° sprinklers are used to water half-circles, while 360° sprinklers are designed to water full circles. Since the watering needs are different for perennials and shrub beds, it is necessary to have separate grids for them. Moreover, you can add a timer, so that it will do the job even when you’re not around. The best feature of this system is the rain sensor which automatically turns off sprinklers when it rains or adjusts the settings according to the weather. Although a drip irrigation system is recommended for perennials and shrubs, sprinklers are more suited for flower beds and lawns. So, now having a breathtaking garden is no more a dream. All you need to do is to install an efficient Sprinkler or Drip Irrigation System to save your time, efforts, and money.